The Crown Inn, Glentham- popular with punters, if not council inspectors. Barely had Rinny Blow finished cleaning and improving her new pub, when the food inspector called. But the publican won’t let a 1-star rating get her down, with her pressing ahead with a kitchen renovation, improvements to the dining area and employing two chefs. 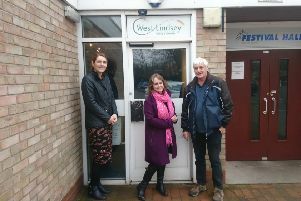 West Lindsey District Council’s food inspectors called at the Crown Inn, Glentham, in April, barely a week after Rinny and her family had moved in. “We closed it down. It was filthy,” she said on taking over the pub. But after the family-run pub re-opened, with some work still to do, the inspectors called and found “holes in the ceiling and in the tiling on the floor”. Now, renovations in the kitchen are underway, the dining area has also been upgraded, along with an outside play area. “It’s a bit sad really, a bit harsh,” Rinny says about the rating. “We are looking at employing two chefs. They came to see me and said the place looked more than 1-star. It’s so upsetting,” she said. Indeed, since the pub re-opened, it has gained much praise on websites like TripAdvisor, with one recent comment being “excellent and highly recommended” and another customer saying “very good service very friendly”. However, as other food providers have told the Rasen Mail, paperwork is a bugbear, with Rinny saying paperwork was the main problem. “We have so much going on. Things are looking good for us,” she added. The Coach & Horses at Faldingworth also received a 1-rating in a recent inspection, but it declined to comment and hung up when we called them. The visits follow a WLDC report which says its inspectors made 396 inspections in 2014-15, compared with 475 in 2013-14 and 242 in 2012-13.